Hunters at work - stop brown bear killing! According to WWF’s fact sheet, there are about 8.000 brown bears remaining in Western Europe and the Carpathians (Slovakia, Poland, Ukraine, Romania). What do you see in the two pictures which illustrate this post? 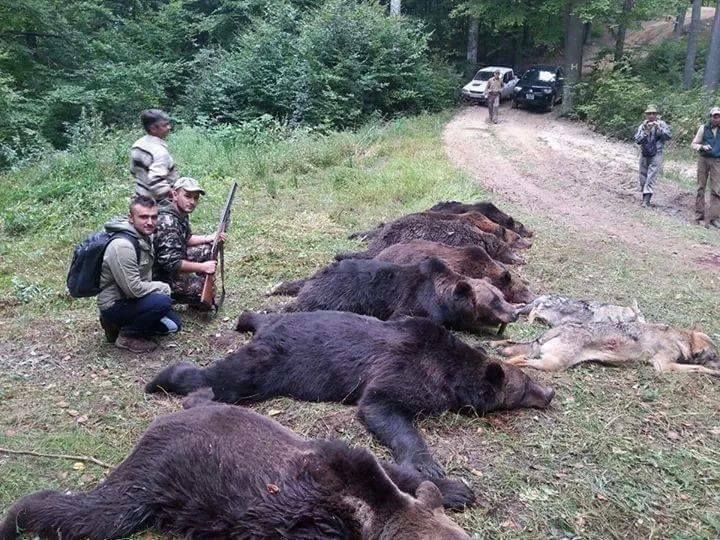 Seven brown bears that were shot (or should we say killed) in the village of Domnesti in Arges county, Romania. According to a recent European Commission publication on large carnivores’ status in the EU, the brown bear number is higher than the WWF’s estimate and is estimated yo be close to 15,000 specimen. Legally most of the bear populations worldwide are strictly protected. More specifically the parts of populations that fall within EU countries, are strictly protected under pan-European legislation (the Habitats Directive) and no exceptions under annex 5 exist. Sweden, Finland, Romania, Estonia, Bulgaria, Slovenia and Slovakia currently use derogations under article 16 of the directive to allow a limited cull of bears by hunters. In short although the species is protected, there are exceptions! We don’t know the story of the hunting on the picture, but it is surely not a good example of ethical and conservation oriented hunting. The seven brown bears (please note thst thete are also strictly protected dead wolves in the picture) represent 0,0467% of the entire brown bear population of the European Union. This percentage does not seem to be a lot, but in terms of the EU human population this would mean killing 236,000 of the identical strictly protected species in Europe: humans!!!! Tif only one person would be killed by a hunter, there would be extensive investigations and a public outcry. There is no outcry about killing brown bears in Europe. There is surely something wrong with this! Posing with brown bearWill the European Union or the European Parliament stop this practice? When will we recognise that we share the planet with other creatures and we shall not kill them for fun? On the other hand, we are fortunate to have some good news on brown bear, but the efforts to save the species for future generations might not be so effective as our hunting practices. The pictures are from the Facebook page of the organisation called Christian Adventure. If you want to help our work to preserve Europe’s large carnivores, please use the donate button on our page! I agree with Bradley and Olga. Stop killing them and learn to live with the Native inhabitants. What a shame!! I know there has been incidents with bears roaming in the city of Brasow in winter, but this is extreme revenge!. What about the Romanian law??? Wir leben alle unter dem gleichen Himmel, aber nicht alle Menschen haben den gleichen Horizont. About bears, do you remember Daniza, the mother bear killed in Trentino? Actually there is a petition against archival of investigation (https://www.change.org/p/non-archiviare-le-indagini-sull-orsa-daniza-chiediamo-chiarezza-e-giustizia?utm_source=action_alert&utm_medium=email&utm_campaign=310557&alert_id=ApVgeHPPtq_Mz2LESdQ99LXynic56rLKjDAJ3dd2zxFFO%2BaOdX4L9g%3D). According to ENPA (national organization for animal protection) there are there are many facts to be clarified. According to another web source (http://www.lultimaribattuta.it/8400_complotto-dietro-luccisione-dellorsa-daniza) does not exist a medical certificate of the aggression. Daniza and its cubs “occupied” the territory interested by a project of extension of local sky area and facilities. The injuried mushroom collector is employed by local cableway company. Did you know that it’s bear awareness week in the US? read more about why we should protect bears as a key stone species and I sincerely recommend watching the video that is linked in the article!